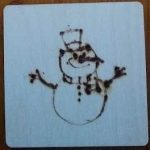 I purchased the Peter Child Pyrography Machine with some Amazon vouchers I was given. I started a test sheet, which I will play with in the coming months. However this was my first attempt of an actual item. 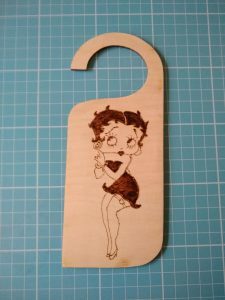 mM friends daughter likes Betty Boop, so this seemed like an ideal one to start with. Despite my earlier posts I did manage to find a job working from home! It is tough going but I am slowly getting the hang of it. For various reasons I can’t mention who I work for on here, but it is still within the gaming industry. Posts on here will continue, just not sure how often ATM. The last 8 months have been spent looking for work. Technically I am still employed, but the business can’t continue to employ me forever, so I need to gain employment elsewhere. It’s easy to see why people hate being unemployed and get dejected. You would think with modern technology that getting back to unsuccessful applicants would be a trivial thing to do, yet virtually no one does. Why? No idea. Anyway my applications continue, so far I have had just the 2 interviews. I think I know what I got wrong with those, but my age won’t help sadly. I have widened the net to all sorts of jobs from mail room/filing clerk all the way up… well for those I think I stand a chance with. I decided not to apply for the job at MI6, the commute to London just wouldn’t have worked out.